Heather and I were supposed to go on our annual mission trip to Honduras. The previous two years have captured our hearts and we have been privileged to be able to go and share the Gospel. It’s quite challenging to spend time with children that don’t even share your language. We thought we were getting on a plane to bless some third world children. Now I know that the blessing was ours. We had trouble raising funds this year as my ankylosing spondylitis limited my ability to cook. I have no idea how many lasagnas I made the previous two years to fund our trips, but I’m glad to have a skill that translates into mission work. We just have a head start for next year. Instead of leaving the country, we went to a neighborhood in our own town. With assistance from Common Ground Community and many friends we were able to launch Operation Love Your Neighbor. 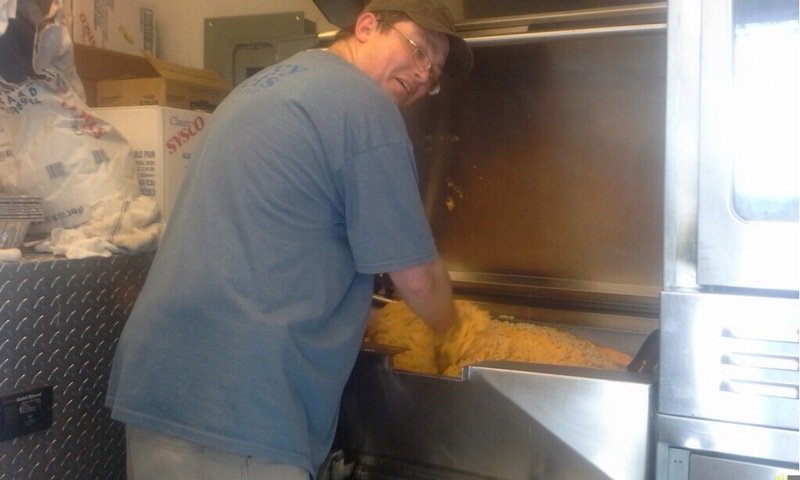 We have typically prepared and served a nice meal one Thursday a month for the past three years. We continued that tradition yesterday and served up a delicious meal of pork loin, roasted potatoes, green beans, and banana cake. We continued today with a nice spaghetti lunch and an afternoon of teaching 22 kids the love of Jesus. Tomorrow, we will conclude the week with a morning walk to visit some homeless friends. This week has reminded me that service doesn’t require trekking around the world. We can serve right where we are planted. Spaghetti, garlic bread, and banana cake. Yvonne Barrier and Brenda Frederick decorating cupcakes with the kids. Heather with some kids that can’t stay still. Maddie making one of her silly faces. The Luomas with a moment together. It was another culinary adventure at Common Ground Community. My middle child, Chef Zoe’, spent the entire day with me to provide this week’s meal.The rain kept a lot of people home, but we fed around 90 from the community plus all of the volunteers. I dunno where the 70 pounds of pork loin went, but I’m sure there were a lot of full bellies.I’ll be serving up spaghetti for lunch tomorrow while my wife, Heather, coordinates a sort of mini VBS for the neighborhood children. Maddie is serving up water. Now she is serving the banana cake. Cajun pork loin, roasted red potatoes, and green beans. That’s a lot of cutting. Heather working hard making plates. Zoe’ cracking eggs for the banana cake. This year is turning into a busy year for Mercy Chefs. As always, we are torn because we want to serve others, but to serve others there must be a disaster. Ideally, our mobile kitchens would get lonely. The real world always has something else in mind. This week we are in Louisville, MS. Last week’s tornadoes his this area pretty hard. I’m thankful that the damage isn’t anything like we saw in Moore, OK last year. Our rotation just started work this morning, and our plans are to stay until Sunday. Mother’s Day. It’s also my anniversary. These deployments are difficult for my family to cope with. Here I am traipsing the world playing chef, while Heather handles everything. Two of my three daughters understand why I keep leaving home, but my four year old princess takes it hard. I have a tough time remembering that my family is sacrificing a lot for me to serve. I’m not some one man wrecking crew. If I didn’t have a supporting wife who was capable and willing to shoulder all of this added responsibility, my small contribution would be impossible. I am so thankful I have her. Today’s sunshine turned my neck a nice shade of red and I’m getting rested up for tomorrow. A local volunteer actually hassled me since I’m from Louisiana. It was all in good fun, but I’ve been craving red beans and rice since he brought it up. Unless the menu changes, we are serving Salisbury steak for lunch and pork loin for dinner. I believe we are preparing lunch and dinner for 500 each meal. We usually serve upwards of 800 per meal, so I may have some time to kick back and catch some rays. Do you love to dance, sing, write, sculpt, paint, or debate? What’s your favorite way to express yourself, creatively? My favorite way to express myself is through cooking. Who doesn’t like cooking? Apparently a lot of people. My mom was a good cook. I say was as if she is no longer among the living. She is a good cook. I usually get to enjoy her food around Thanksgiving. Around June, she will ask me what I want to eat. Since we stay three days, there is room for more than turkey. Chicken and dumplings usually hit the list. So do pork chops, egg salad, seafood dip, and whatever else I can get her to make. Still no salmon patties. I may have to resort to threats. The short order cooking adventure is always surprising as my mom hates cooking. She despises it. As long as I remember she has always hated cooking. I never watched her cook. I never learned her techniques. This skill is mostly self-taught. 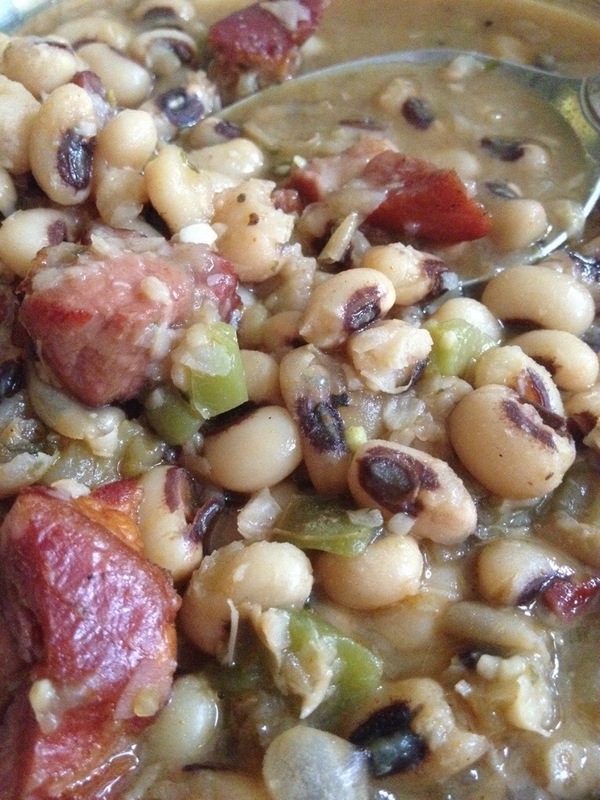 Black Eyed Peas I made for the Thursday meal at Common Ground Community. The neighborhood along with homeless people from the area come to eat and worship. I believe I mentioned couch surfing for a couple of years. My friend who lent me his couch was also kind enough to let me watch him cook. I watched. And watched. When I got tired of watching, I watched some more. That’s all I ever did there. I remember I was allowed to stir gravy a couple of times. Woohoo! Actually, I was really jazzed. It took me years to get the gravy just right. It’s simple to make, but it is more art than flour and oil. Sixteen years later, my fanaticism has only grown stronger. Yesterday, my wife told me that she lost the three pounds that she gained from my recent cake spree. She likes my food. I have friends who take phenomenal pictures who will shoot my food in exchange for a meal. This would be a bad trade if I made them a pan of Hamburger Helper. The past two years I have spent volunteering with Mercy Chefs, and now I have finally decided to try my hand at catering. Hence, the name Cater It Forward. We have a long way to go on, well, everything. There is a lot more to this business stuff than slinging hash. Making an income is secondary. The original plan was, and still is, to cater to raise money so I can afford to deploy with Mercy Chefs. The organization is 100% volunteer. This business can help earn gas money, hotel accommodations, airplane tickets, whatever I need so I can serve others through Mercy Chefs. 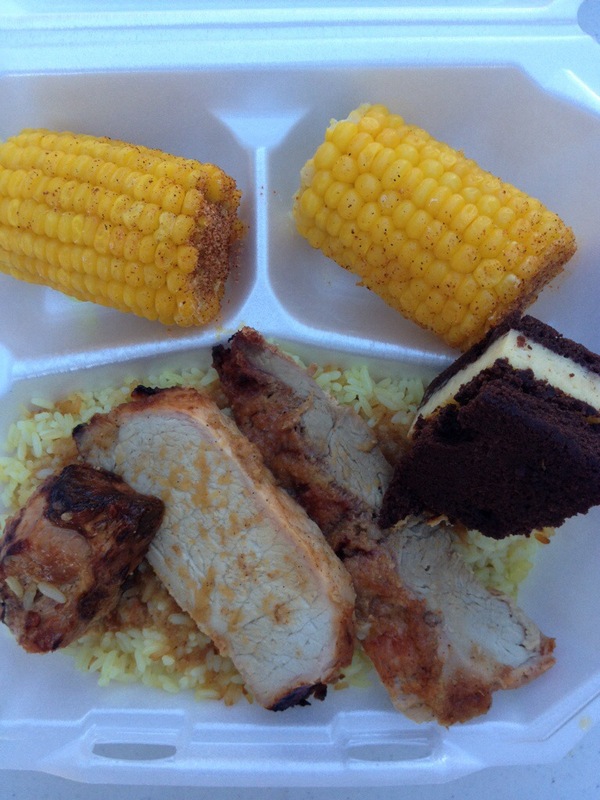 Cajun pork loin, rice pilaf, corn and a layered brownie thing. This was one of the meals served in Colorado. This organization has been to Africa. I went to with Mercy Chefs. My good chef friend was in the Philippines recently to provide aid. 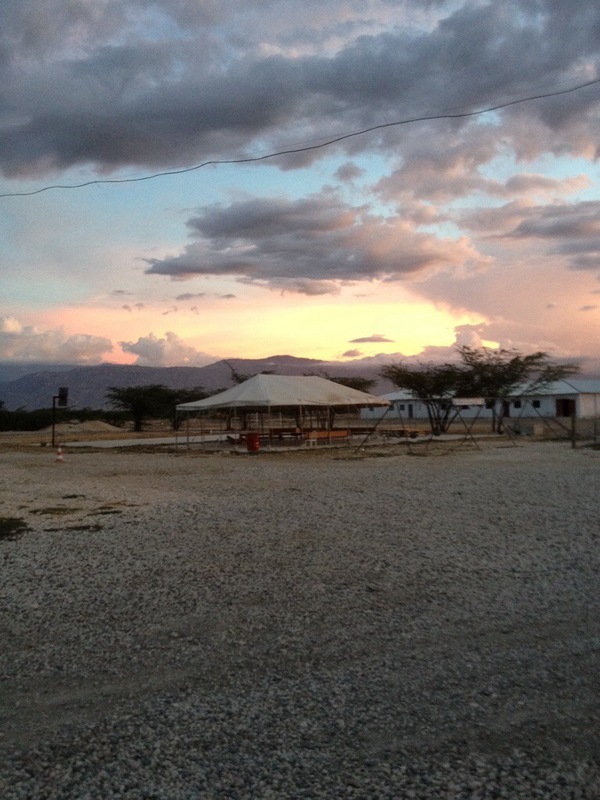 On Nehemiah Vision Ministries’ compound just outside Chambrun, Haiti. Am I starting to sound like a shill? Sorry about that. With all of this cooking, I think of that 80’s drug PSA. Or was it the nineties. “I do coke. So I can work longer. So I can earn more. So I can do more coke.” Cue the sad trombone: Wah wah wah waaaah. The infinite cocaine loop. I cook. So I can serve others. So I can do more coke cook. It’s not perfect, but I hope I was able to illustrate my point. (Featured image was a result of bartering food. My good friend Josh shot the image).